Dr.Explain is a help authoring tool for rapid creation of help files and user guides. 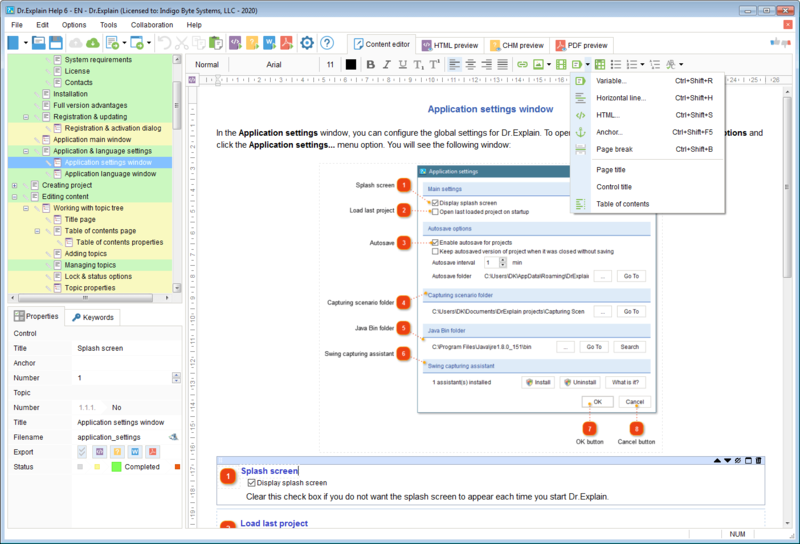 Using its unique auto capture and annotation technology, developers can document their software interfaces almost hands down. When set to work, Dr.Explain parses a live application and automatically produces screenshots of its windows along with a sequence of callouts for each window control. Users only have to add some description to each callout as needed. Dr.Explain can output the results as a set of HTML pages, CHM help file, RTF, or PDF document complete with screenshots, cross-references, menus and an index page. The output is accurate and professional. Abex PDF to Text Converter 3.9: Extract text contents from PDF into TXT document Smart PDF Creator 14.4: You can batch convert all your printable documents to PDF format fast and easy. Abex PDF to Flash Converter 3.9: It is easy-to-use and provides the best way to convert PDF to SWF flash Soft4Boost Burning Studio 5.5.9.245: Burn various data onto DVD/CD/Blu-Ray discs with Soft4Boost Burning Studio.